If I first started writing about Mehlman in 2004, why is Ken getting his Roy Cohn Award now? Because I am able to report – here for the first time — that Ken Mehlman, the former Chairman of the Republican National Committee is set to come out of the closet in a column by Atlantic writer Marc Ambinder Friday morning or early next week. This will be on the heels of him being included in fundraising letter supporting marriage equality. The three people most responsible for the anti-gay actions of the Bush reelection campaign are Mehlman, Karl Rove and Bush. 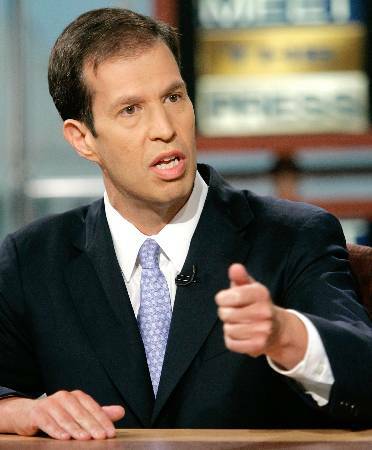 In addition to his role at the RNC, Mehlman served in the first Bush Administration as White House Political Director. In 2004 he was the general chairman of the Bush reelection campaign. If this move doesn’t call for a Roy Cohn Award, I don’t know what does. Ken Mehlman is horridly homophobic and no matter how orchestrated his coming out is, our community should hold him accountable for his past. I want to hear from Ken that he is sorry for being the architect of the 2004 Bush reelection campaign. I want to hear from Ken that he is sorry for his role in developing strategy that resulted in George W. Bush threatening to veto ENDA or any bill containing hate crimes laws. I want to hear from Ken that he is sorry for the pressing of two Federal Marriage Amendments as political tools. I want to hear from Ken that he is sorry for developing the 72-hour strategy, using homophobic churches to become political arms of the GOP before Election Day. And those state marriage amendments. I want to hear him apologize for every one of those, too. I agree. Ken Mehlman cynically used his position of influence to rake in mountains of cash for himself, and he willingly did it on the backs of his gay and lesbian brothers and sisters. If Mehlman is still a Republican, I’m sure the GOProud people will embrace him with open arms, because they don’t really care if a person is anti-gay or gay-supportive. They’re pretty much in it for tax cuts and self-shaming purposes. Mehlman will fit right in, in that case. But if he suddenly wants to become a spokesman for The Gays and The Equality, he’s got a lot of explaining and apologizing to do.